Like to eat grass, clover. Wild turkeys are ominous, eating nuts, snakes, insects and berries. A farmed turkey will eat soybeans and corn. Head changes colour hen it is excited. A male turkey will blush when he meets a female turkey. Can drown if they look up while it is raining. Can fly - but not very fast or very high. Skins are used to make cowboy boots and belts. 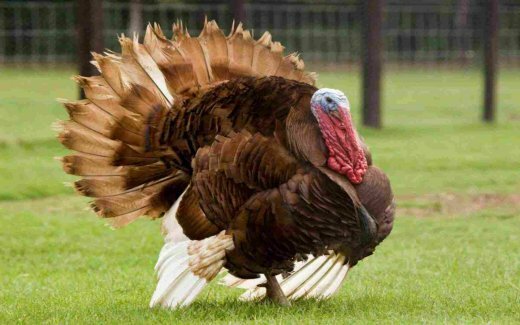 Benjamin Franklin wanted the turkey to be the national emblem of the United States - the turkey (not the national emblem The Bald Eagle, gets the 'honour' of being the dish of the national holiday - Thanksgiving.